North and South Korea on Thursday kicked off their first general-level military talks in over ten years at the truce village of Panmunjom, the Ministry of National Defense (MND) announced. The meeting between military authorities began at 1000 local time in Tongilgak, on the northern part of Panmunjom as part of follow-up measures to the Panmunjom Declaration signed by the leaders of the two Koreas in April. The inter-Korean general-level military talks are the first of their kind since December 2007. April’s agreement saw the two Koreas commit to “convene military talks at the rank of general in May” as a first step towards holding regular meetings between military authorities. Despite the inter-Korean agreement, general-level military meeting were yet to take place until Thursday. The South Korean military dispatched a five-member delegation led by Kim Do-gyun, head of the North Korea Policy Bureau at the defense ministry, to the general-level military talks. Kim — who served as presidential secretary for national defense reform until May — participated in inter-Korean working-level military talks in February 2011 and high-level talks in February 2014. The other four delegates come from the MND’s North Korea Policy Division, the maritime operations division of the Joint Chiefs of Staff (JCS), the presidential office’s National Security Office (NSO), and the Office of Inter-Korean Dialogue of the Ministry of Unification (MOU). Pyongyang, in turn, sent a total of five delegates led by Army Lieutenant General of the Korean People’s Army (KPA) An Ik San to the talks. An previously served as the chief delegate to the first and second inter-Korean general-level military talks in 2004. The inter-Korean military talks come two days after a summit between U.S. President Donald Trump and North Korean leader Kim Jong Un in Singapore. The aftermath of that summit, however, saw Trump announce that he would suspend regular ROK-U.S. joint military drills. The U.S. and South Korea typically hold a number of large-scale joint military drills every year, including Foal Eagle/Key Resolve (FE/KR) in March and April and Ulchi Freedom Guardian (UFG) in August. 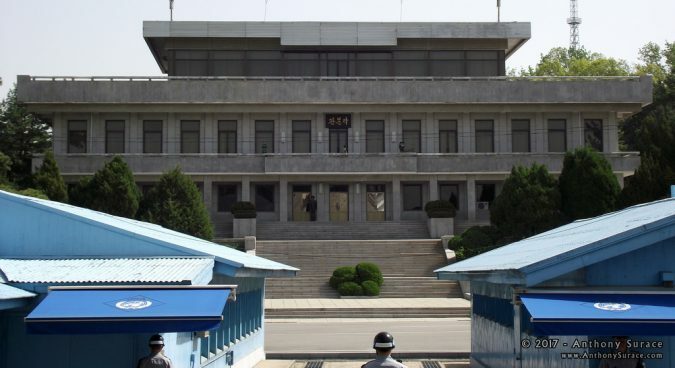 Since then the two Koreas have since May 1 ceased “all hostile acts,” including broadcasting through propaganda loudspeakers and the distribution of leaflets along the military demarcation line (MDL).